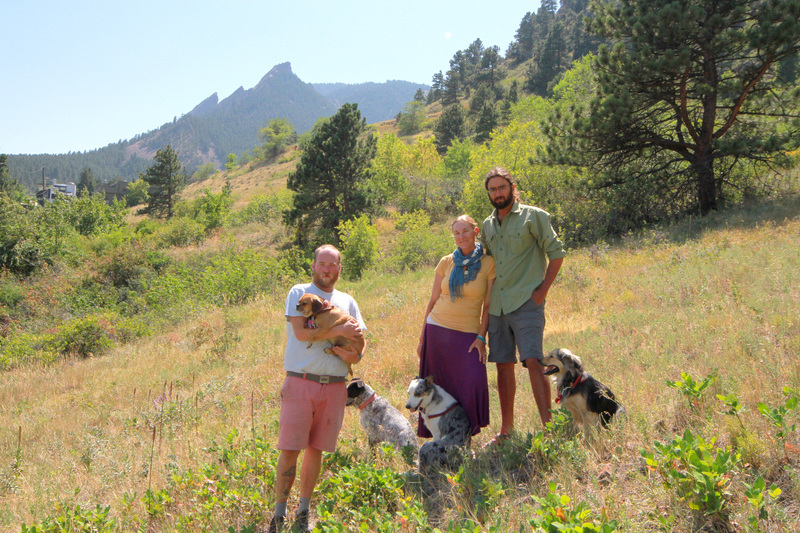 From left to right: Jon Slater and Old Brown Dog, Grace, Jenny #9, Kait and John Seyal, and Max. I was born in Chagrin Falls, OH to my amazing, loving parents, Tom and Sue Whistler, on October 1st, 1985. My interest in animals and art were always supported by them and I thank them both. My older sister, Eryn, is a high school science teacher, and my younger brother, Patrick, works as a mechanical engineer. I grew up with a love for animals and was given horseback riding lessons for my fifth birthday. By age 12, I was working at a local horse farm, cleaning stalls and scrubbing water buckets after school. I was given a horse of my own when I was 13. Art caught my attention some time in grade school and has been infused in my life ever since. I graduated from Chagrin Falls High School in 2004 and went on to study Art at Ohio University. I met my husband, John Seyal- a fellow art major- during our first few weeks at school and we quickly became collaborators and close friends. I graduated with honors in 2009 with a dual B.F.A. in Painting and Art History. I adopted Grace from Camelot Puppy Sanctuary in August of 2007 and my life quickly changed to involve her on every level. She was my constant companion and shadow. When we lived in Athens and went everywhere on foot, Grace and I walked 8-10 miles every day. It is because of Grace that I fell in love with walking. After graduating, John and I moved to Somerset county, Pennsylvania where I worked as a program director for one horse farm, then farm manager for another. I loved my life there, but knew that I was not ready to settle down just yet. There was too much world yet to be seen. The wanderlust had taken hold. When I started looking for a rescue dog, I was not worried about breed, size, color, or even age, as long as the dog was over a year old. I just wanted the right dog to be my shadow. I spent weeks searching petfinder.com and other rescue organizations, sending emails asking about dozens of dogs. Then I came across “Ellie”, a 2 year old mix at Camelot Puppy Sanctuary. I went out to meet her a couple of times, not wanting to make a snap decision. She had already spent 18 months at the rescue and had been taken home by several families, but always returned for her under-zealous demeanor and pit-like face. When I brought John to meet her, he also saw her as fat and slow with no personality. However, I felt she had incredible potential and assured John that she would come around. I brought her home and named her Grace. She has been at the center of my life since. For the last five years, I have made a point of taking her everywhere. She visits the bank, preschool, hardware store, feed store, goes hiking and camping, takes road trips and vacations, and even came to Key West for our honeymoon. She attended many of my classes in college earning an honorary art history degree, has been a large participant and subject in my artwork, and has visited over 25 states. She even carries backpacks and pulls a cart. While attending a class, a professor told me that she would be perfect for therapy work and the idea stuck. 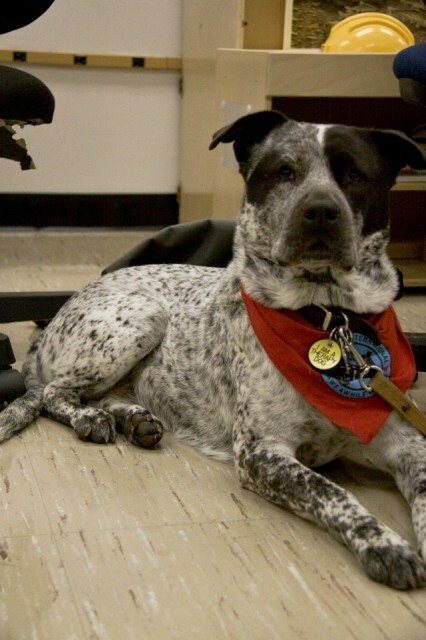 She was certified as a Therapy Dog in 2009, and is now certified through Pawsibilities Unleashed. When we are at home, we volunteer weekly at the local Ronald McDonald House, The Altenheim, and do a reading program with an Indiana Elementary school. As we walk across America, we love to show the world that a rescue dog, even an adult rescue, truly can do anything. 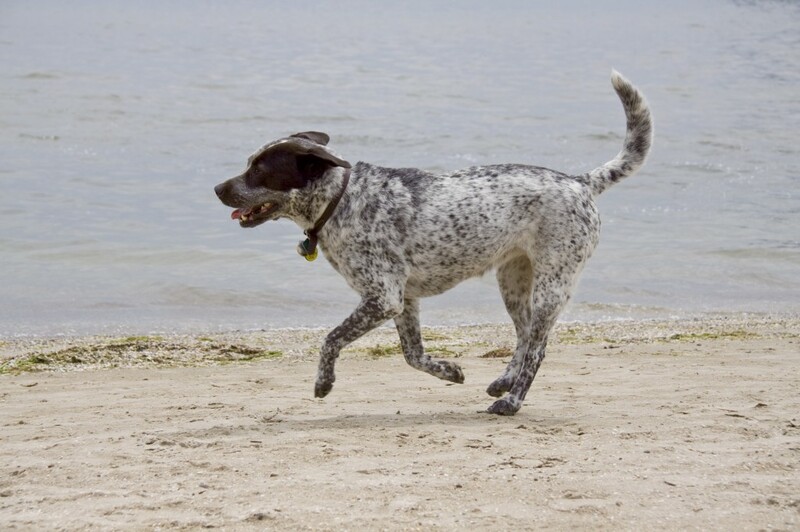 Grace has proven herself to be a loyal and dependable companion in any environment and situation. She is everything I was looking for and has inspired me to dedicate my time and energy to service. I am eternally grateful for all the joy, inspiration, and positivity this dog had brought to my life. All this from a dog that no one wanted. I am a native son of Louisville, KY. I spent time in the great outdoors as a child, but spent most of my young adult days inside, glued to my computer. I was not very active or productive for those years. I became fascinated with photography in high school, and attended Ohio University’s School of Art as a Photography major. I met Kait in the Fall of our freshman year in 2004. The university had this great idea to put all of the first-year Fine Arts students in one residence hall together – little did they know that this would eventually lead to their artists marrying each other. Kait and I were best friends from the beginning, and she has always been a powerful collaborative force in my art. As we grew and learned side by side, our love for each other grew into a strong relationship. 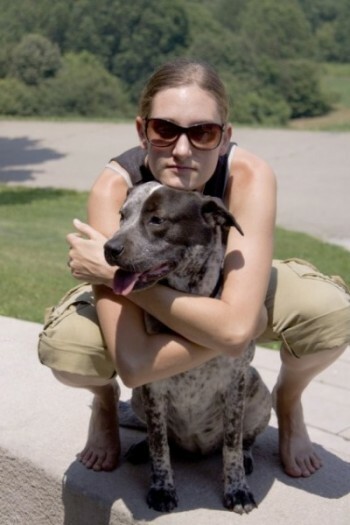 When Kait adopted Grace in 2007, they helped shake me out of the lethargic rut I had been in. Being around Grace inspired me to adopt my own dog, and a few years later I brought Max home. My lifestyle became more and more active, and I spent more and more time outside exploring with Max. As I learned to understand Max, I came to understand myself in a new light. I unglued myself from the computer and television, and began to reclaim my body and mind. When we graduated in 2009, I went to Pennsylvania with Kait to work on horse farms. For the first time in my life, I spent all day, every day outside, using my whole body to get things done. I had never lived such a life, and I saw it as a challenge to grow as a person – to further my education. I learned what real hard work is, and that I have a lot of growing and learning left to do. Of course, nothing in life is constant but change. Shortly after we were married in September of 2010, we made the hard choice to leave the farm for an offer back in my home of Louisville, KY. Now I work in a factory, designing and making handmade boxes, far away from the sun and rain. I miss the farm. I miss living outside. When Kait brought Grace home from Camelot Puppy Sanctuary, I considered myself more of a “cat person.” I watched with fascination as they developed a deep and powerful bond to one another. I spent two years learning from Kait and Grace before I went out to Camelot to start looking for my own dog. 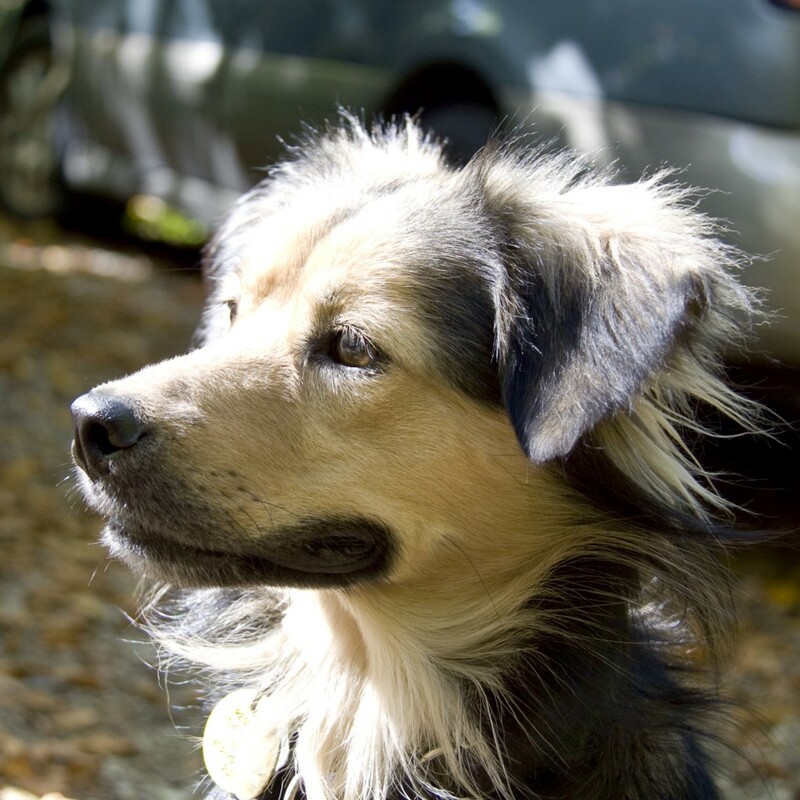 Max seemed to be everything I wanted in a dog – smart, friendly, and eager to get out and see the world. He had energy and enthusiasm, and he was overflowing with charisma. Understanding the gravity of the commitment I was about to make, I wanted to think about it for a few days before making my decision – but the world had other plans. Stephanie, who runs Camelot, had become a good friend of Kait’s since she had adopted Grace two years before. She knew we had plans to hike and camp that weekend, so she suggested, “Why don’t you just borrow him for a few days? Take him on a field trip. It’ll be good for him. You can bring him back early next week.” I thought this sounded like a fantastic idea, so in the car he went. We never brought him back. You’re a clever one Stephanie. Now more than two years later, Max and I are inseparable. I take him everywhere I possibly can, and he is the best company I could ever ask for. He helped me when I worked at Sycamore Run Early Childhood Center – he loved keeping the kids entertained during recess – and he was my shadow and loyal companion every day when I worked on a horse farm. Now we live in a city, and even though he can’t come to work with me we make a point of finding adventurous activities every day. We go hiking, camping, and traveling. We take epic walks around the city. We party and dance around the living room every day. We make regular visits to the Ronald McDonald House here in Louisville, KY, spreading positivity to families going through very difficult times. His charm and enthusiasm brings so much joy to the people we visit! Rescuing Max has been the most rewarding thing I have ever done in my life, and we will spend the rest of our time together spreading our love to as many people as we can. Kait Whistler and John Seyal were married in Rockwood, Pennsylvania on September 18, 2010. Today, Kait and John are based in Louisville, Kentucky. Both Kait and John are active pet therapy volunteers and working artists at home and on the road. Their art can be viewed at www.KaitWhistler.com and www.JohnSeyal.com. Jon Slater and Old Brown Dog. Jon is a native son of the Great State of Ohio, born and raised in the city of Lancaster. He loves his mommy and his daddy. At age 2, he began his lifelong love affair with music, and spent his youth singing in choir and ska bands. He brought that passion for music and art with him to Ohio University, where we all met in 2004. 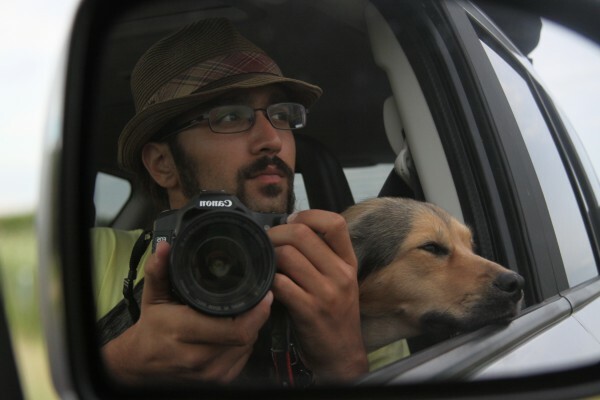 He adopted the Old Brown Dog – then called “Shnookums” – from a friend who simply didn’t have the time and patience to care for a dog. They have a powerful bond – we have never known a dog that loves their owner as much as Brown Dog loves her dad. We have adventured together on many an occasion, but this is a new chapter in our friendship. He is so committed to the Walk that he quit his totally amazing coastal dog-walking job in the San Francisco Bay area to join us on the road. Starting at the Mississippi River, Slater is driving our support vehicle all the way to the Pacific coast. It is a boring and tedious job, but one of great responsibility – after all, he is responsible for keeping our dogs safe during the heat of the day as they ride safely in the car. Thanks to Jon, we have a much-needed safety net to ensure to health and happiness of our dogs. Also, he is a lot of fun to have around. 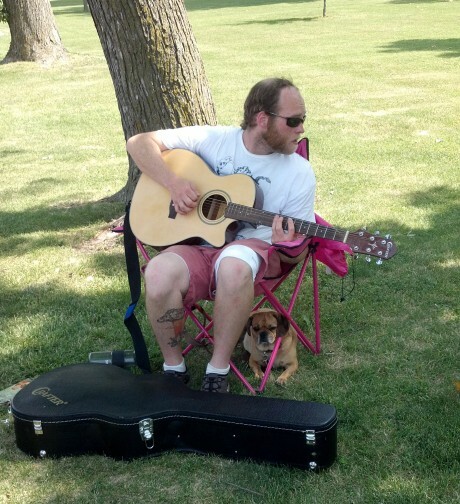 Brown dog is also a certified Therapy Dog and helps out on visits, while Jon often brings along his guitar and entertains the groups we visit. 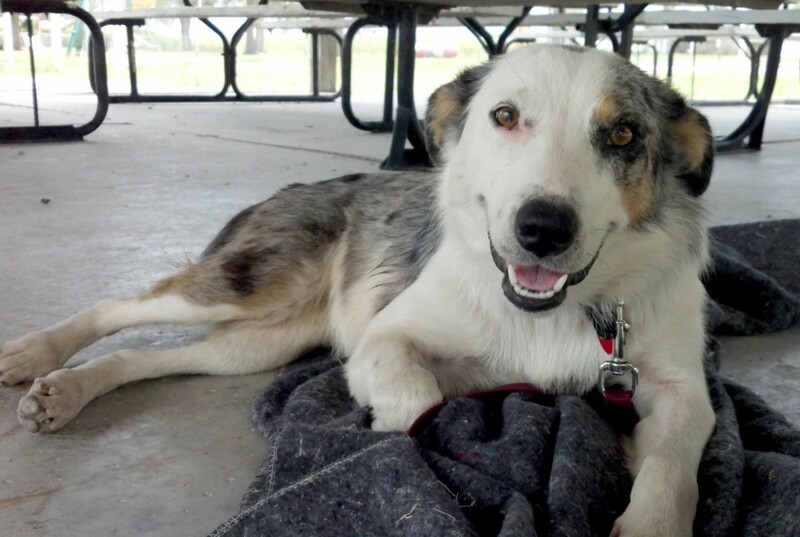 Somewhere in Iowa, Jenny came running out of a cornfield and into our lives. She was emaciated and covered in ticks, and came right up to us like she had been waiting for us to come along. After she followed us for a few miles, we leashed her and took her to the next town to check the shelter and, since nobody was looking for her, get her vetted. A kind stranger even donated her vet bills. Jenny has been with us since, learning all kinds of crazy new people stuff. 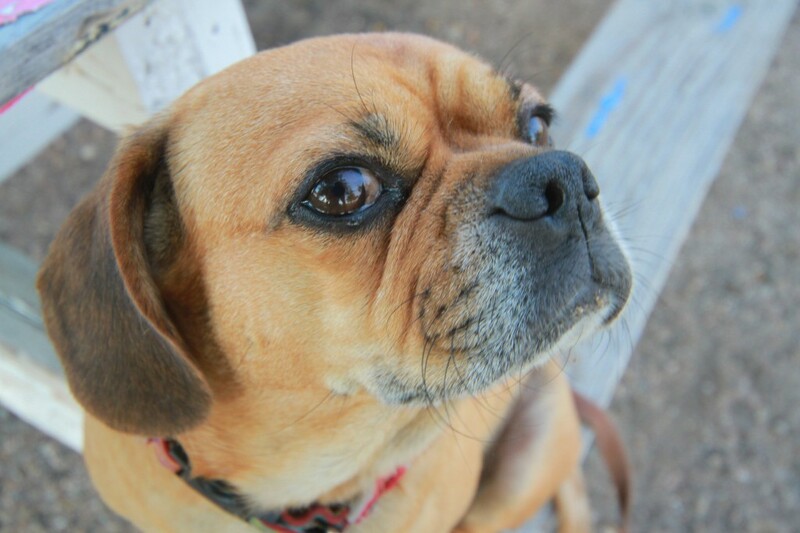 Thanks to her people-loving personality, she is insured and in training to be a Therapy Dog. While technically we are fostering her, letting her go would prove difficult. We really like this little bugger. What an enormous undertaking ~ for a marvelous cause! You will be forever changed by this experience 🙂 ~ Best of luck to you and the sweet dogs! Hope you guys are doing well. Best of luck to both of you for your good cause. Our prayers and best wishes are with both of you. Kait- I came across this website when I was reading your article in the Athens News. The further I read into it and glanced through pictures, I kept thinking to myself that I recognized you from somewhere. About an hour later I remembered that you came to work for us as a wrangler at Uncle Bucks Riding Stable several years ago! This is a great story, you and John are doing a wonderful thing! I’ve been using horses at therapy animals for some years now, and we’re currently in the process of getting my little brother’s Doberman Pinscher certified as a DAD (Diabetic Alert Dog). Animals are such amazing healers! I wish you all the best in your journey! I was thrilled to see you are doing well. Give your puppies a kiss for me! Take care. Hello! I just met you guys at the Hoopeston, IL nursing home on 6/5. I just wanted to say thank you for stopping by! The residents loved your dogs. The cause is so interesting, so kudos for you two I hope we gave you all a warm welcome and we will all be keeping track of you guys. Good luck with the rest of the journey! you guys rock! glad to see youre all doing well and that slater joined the team! hope to see you all sometime soon or at least talk and catch up… miss you guys! good luck on your adventure and keep up the good work! Hey guys I can’t thank you enough for visiting the Monarch and making some amazing memories with the residents. Some of them are still talking about it. I have passed the remaining business cards out to some of the family members and they plan on looking you guys up as well. I love what you guys are doing and it is really inspiring and comforting to know that there is people who care and have found something that drives them. If you guys make it back this way ever feel free to stop by!!!! thanks again and I hope you guys have a fun and safe trip! We were in the King Buffet restaurant in Hastings. Got to meet your dogs outside. What a great bunch. Hope all of you survive our terrible dust-bowl heat wave we are having. Good luck on your trip and adventure! My husband and I will be starting The American Discovery Trail the 1st week of September 2013. I liked to see others then just ourselves doing this for a good cause…the dogs. Please check out our website. It’s still in the beginning stages so bare with us. Hope to maybe discuss your experience some day. Thank you for your strength and courage. Minola, godspeed on your journey. It is a dangerous road out there, so be on your toes! I checked you website, and I didn’t see any entries in the month of September. Did you end up leaving on time? Please let us know.